Full details of the research, licensing and management services we provide. For over 35 years, we have researched, licensed and managed media content, improved workflow and reduced licensing costs for many of the world's leading publishers, broadcasters and museums. I will be visiting Clients in the US in April	and	would really like to meet with you. Can we fix a date ? 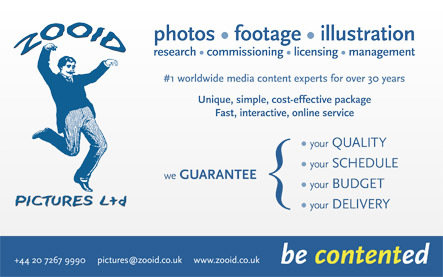 Zooid finds all the media you need and delivers it exactly to your requirements, rights cleared, via our highly acclaimed and simple to use interactive service. Instantly view, select, comment and order the photos, footage and illustrations you need, commissioned or stock, uniquely guaranteed quality, rates, deadlines and rights. No paperwork and no loose ends. Zooid brings top researchers, unparalleled expertise and a unique project / asset management system to solve every aspect of your media content needs, in a simple online customised fixed-rate package that consistently surpasses client expectations.